This is what your spending your time doing in these league meetings — deciding on the fate of pre-game rituals? First, it's sad to begin with that you're even bothering to waste time discussing them at all and what's even worse is that you came to the conclusion to set a 90-second timer to force players to cutback on their pre-game handshakes and rituals (e.g. 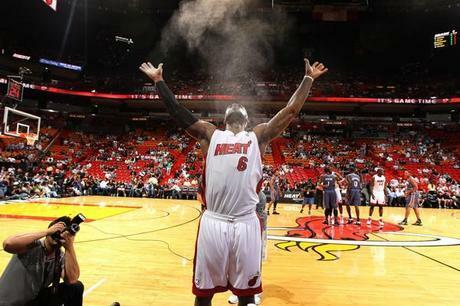 LeBron James' chalk toss and Dwyane Wade's pull-ups on the rim, etc.). And for what? So the games can start maybe five minutes sooner? You do realize that these pre-game rituals are not only fun for the players, but the vast majority of them (especially LeBron's chalk toss) have become big hits with the fans in the arena as well, right? Granted, would not having them take away from the game very much? Not likely since the real show starts after tip-off, but the fact of the matter is that basketball — probably more so than any other professional sport in our country — has evolved beyond the point of only being a game; it's become a full-scale production of pure entertainment. Simply put, it's a spectacular show within a game. As expected, the players are not responding well to the change. "I personally don't like it," Oklahoma City Thunder star Kevin Durant told 'The Oklahoman'. "Every player in this league has routines they do with their teammates, rituals they do before the game and before they walk on the floor. The fans enjoy it. You see the fans mimicking the guys who do their stuff before the game. To cut that down really don't make no sense." I agree with Durant. Doing this doesn't make any sense. I mean, who really cares if the game starts five minutes later? The television networks? Doubtful, especially considering that most games still end ahead of schedule or on time despite all of the pre-game rituals by the players. In the end, it doesn't matter though. The owners run the league and sign the checks, so they will ultimately set the rules. The pre-game rituals are going to be cut down, but I guess if it cuts out one commercial break (fingers crossed) then I'm okay with it. What does everyone else think? Do you agree with putting a 90-second timer on pre-game rituals during NBA games?